Throwback Book Thursday Vol. 1: America’s Betrayal – It's Lily O. For the Inaugural Throwback Book Thursday, I picked one of my favorite historical fiction books geared toward a middle-school audience, America’s Betrayal. I stumbled across Jodi Icenoggle’s book America’s Betrayal many moons ago while looking for a new read in Barnes and Noble. The title intrigued me and the subject matter was one that was new to me as a middle-schooler. I was learning about the Second World War, but outside of Pearl Harbor and The Holocaust, my knowledge of the war’s effects state-side was very limited. America’s Betrayal opened my eyes and allowed me to gain a new perspective on the lesser-thought of casualties of war and my country. America’s Betrayal quickly became one of my favorite books, and one that I can still learn from today as an adult. On December 7, 1941, sixteen year old Margaret Yamaguchi’s life is changed forever. America, the country of her birth has just been attacked by her parent’s birth country, Japan. 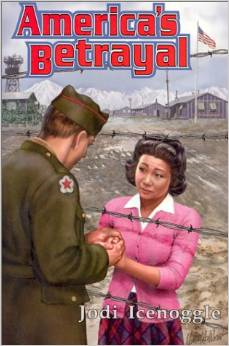 Viewed as an enemy by her once beloved classmates, neighbors and her government, Margaret, her family, and other people of Japanese descent on the West Coast are evacuated from their homes and sent to internment camps. America’s Betrayal follows Margaret as she navigates coming of age while being treated as an exile in her own country.